The Conner Handmade Hats brand consists of hundreds of different styles, and OutWest adds new styles as they become available. We are impressed by the quality, design details, environmental friendliness and we know you will want a wardrobe of their hats. There's something for everyone. Western Wedding? Great raffia Western Cowboy style? Are you an Outback or Safari adventurer? Maybe the classic Victorian Top Hat, Bowler.or Fedora is your style? We've got you covered! HATS PASS THE SUN TEST! Many Conner Handmade Hats have been tested by The Australian Radiation Protection and Nuclear Safety Agency (ARPANSA) who not only gave us all the facts on what a UPF (Ultraviolet Protection Factor) rating is and how it relates to sun protective garments in general. What they learned was that if any hat has mesh or large holes it cannot be rated. Other companies are putting UPF 50 on their hats that are made with mesh when only the part of the hat made of solid material has UPF 50 protection, not the mesh. This is misleading and dangerous to hat wearers. Australia has some of the highest skin cancer rates in the world so we are confident the agency did a great job of testing Conner Handmade Hats. Many of these hat styles are offered in Shapeable Raffia and include a pinch protector. All one size and two size hats are fitted with a deluxe, soft terry inner stretch band. Work with OutWest to Outfit your Staff, Team, Cast, Band, or Special Event Participants! Are you outfitting a your wait staff, bridal party, theater production, band or team, or need mutliples for your staff and volunteers for a special event? Please contact us before you place your order! We may be able to offer a quantity discount as well as a reduction in the shipping cost. Before placing a mulitple order we suggest shipping one hat (returnable if not to your liking) of the style you are interested in to verify it is just what you need or passes the approval of the costume designer, special event committee, etc. Purchases of multiples are not returnable. Upon placing your order with OutWest, your hat will be shipped directly from Conner Handmade Hats. Fresh and new. No other head has tried it on. Pristine condition. No worries. Your order will be delivered via USPS Priority Mail, usually within 2 business days after OutWest receives your order, and we'll send you the tracking number the day it ships from Conner Handmade Hats. Not to your liking? No problem. Give us a call for a Return Authorization number, put it back in the box and return to: OutWest, 16654 Soledad Canyon Road, #148, Santa Clarita, CA 91387. Approximate shipping weight per hat is listed below based on brim size and crown height. All hats are drop shipped from Florida, via USPS Priority Mail. Our shopping cart determines shipping cost for all orders shipping from our Califonia location. If you live on the east coast or midwest, costs of shipping direct from our Florida based vendor to your address may be less than the shopping cart determines. In those situtations you will receive a credit card refund for the shipping overcharge. If you live west of the Mississippi, the actual shipping charge may be higher and OutWest will cover the additional charge. If you are an international customer, shipping is available but there may be additional shipping charges. Multiples of same hat may ship in the same box, although not always possible. Ordering multiples? Call OutWest toll free 1.877.340.9378 in advance for availability and shipping cost estimates. International shipping is available, however additional shipping costs may be applied. We'll contact you first with the total estimated shipping costs. Please be aware that you may be required to pay your country's duty fees. Estimated delivery time of your order is 2-3 weeks. Many of CONNER'S straw hats come with a wire in the brim so you can shape the hat to match your style. With a little practice you can reshape your hat brim easily. Western styles are generally worn with the brim turned up on the sides and Australian style hats look great with a dip in the front and the back. It’s best to spot clean all cloth hats with a damp cloth using cold water, or hand-wash in a sink if necessary. We recommend using plant-based soaps because regular detergents can be toxic for our waterways. Always let your hat dry naturally. If your hat gets out of shape, you can use steam from a tea kettle to reshape it. Hold the hat in the steam and allow it to soften. You can then reshape your hat to its original shape and then let it cool down before wearing. Another option to take out wrinkles on the brim is to place a clean rag or old T-shirt over the wrinkled area then iron the area. Tea stained hand braided raffia cowgirl hat with a vented crown, shapeable brim and a colored stone band. Fitted with a deluxe soft inner stretch band for comfort and fit. Heather Cowgirl Western hat is made from hand braided raffia that was harvested on the island of Madagascar. Raffia is a fast growing renewable resource. The hat features an elegant three strand removable necklace. Two beautiful products in one! Shapeable brim and fitted with a soft deluxe inner stretch band for comfort and fit. 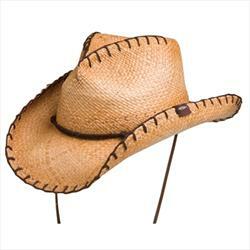 Beach & Resort Cowboy Western Style: Raffia Kids "Coby"
Coby Kids Western hat is made from resilient raffia. The brim can be shaped, features a cotton chin cord. Fitted with a deluxe soft inner stretch band. The Latin Quarter ladies' sun hat is made from crocheted organic raffia. A great beach hat that packs flat in your bag for travel. Grace Straw is a very elegant hat, but don’t be afraid to garden in it! Made from fine sewn braid toyo and fitted with a soft inner terry band for maximum comfort. Summer in Charleston. There is nothing like summer time in the south, especially in a beautiful town like Charleston South Carolina. Made from sewn braid Toyo and fitted with a soft inner terry stretch band. Features a soft chin chord but not shown in the photo. Summerville wide brimmed sun hat gives excellent protection and is nice and soft but still holds it shape. Cool As A Breeze Mesh with Scarf is of waterproof canvas and features a mesh crown for hot days, also is crushable and has a removable scarf band. Please note, scarves vary on every shipment so what we have in these photos are not necessarily what will be shipped. The good news is that you can remove the scarf and put anything you like on the hat. It's great to customize an outfit. Handmade in Byron Bay, Australia at the BC Hat factory.